Richard Murray: "Yesterday I sat down with Alan to discuss our plans for the future and Alan was as honest as he has always been throughout his time at Charlton and told me he would not be extending his current contract. We enjoy a fantastic relationship and Alan only wants to do his best for Charlton for whom he has a deep affection. Alan is, in my opinion, the greatest football manager this club has ever had. We both agreed that it would, therefore, be in the interests of the club and Alan if we parted company at the end of the current season. We do so as the best of friends. 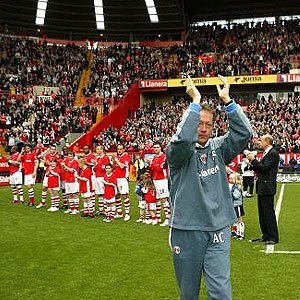 Alan will manage a Charlton team for the last time at Old Trafford next Sunday and today is his last match in charge of a Charlton team at home. When Alan emerges from the tunnel today I would ask each and every one of you to stand and pay tribute to a remarkable man and leave him in no doubt of the genuine affection you all hold for someone who has done so much for our football club and is, in my opinion, the greatest football manager this club has ever had." And he is and the fans let him know it as they gave him a two minute standing ovation towards the end of the game.